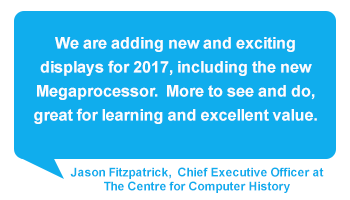 "Our new displays and activities are designed to support the teaching of Computing in the Curriculum and much more." Time travelers start young at the Centre for Computing History. Whatever their age, young people are welcome to visit the Centre and explore our computing past. 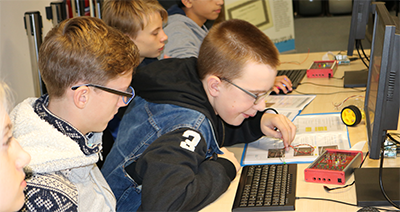 A hands-on learning experience wrapped up in a historical context, offers young people an insight into the computing curriculum beyond classroom-based learning. The Centre welcomes visits from Community and Foundation schools, Academies and Grammar Schools, Special schools and Independent schools, FE Colleges, Universities and all organisations supporting the education of young people. offers knowledge and experiences relevant to the curriculum and beyond, with added fun! Ofsted recognises that museum visits and learning outside the classroom improve the quality and depth of students’ learning and considers it essential to offering young people an outstanding broad and balanced curriculum. Ref: Learning outside the classroom: How far should you go?, Ofsted (2008). Why visit the Centre for Computing History? 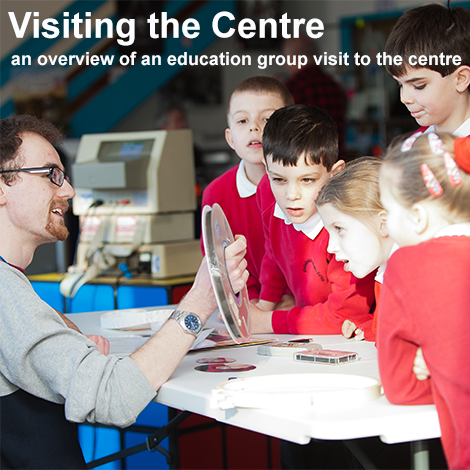 Click here to download our two page document helping you make the case for an educational visit to the Centre. What will a group experience? 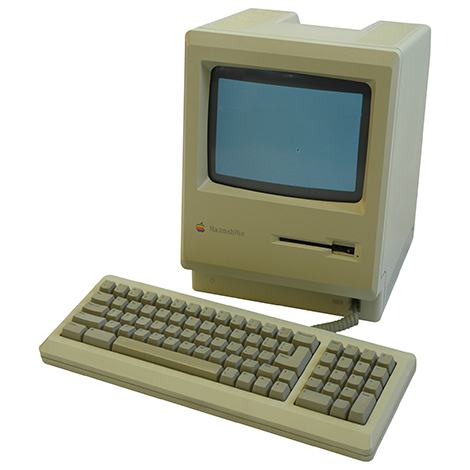 The Centre presents a unique collection of artifacts with particular emphasis on the rise of personal computing from the huge machines of the sixties to the impact on us all today. Discrete displays in the main gallery present the technology through themes such as; the sixties, military machines, connected world, games, business machines, calculators and much more. Young people visiting the Centre will explore the timeline of computing, using the artifacts and displays as evidence of progress. Many artifacts are touchable and supported by demonstrations and activities. Even computer games have a history and our young visitors always enjoy a visit to the Centre's games zone. What games were mum and dad playing when they were young and what has led computer games to become the major worldwide industry that it is today? In this exciting presentation students will explore the development of games consoles, learn about game design, mechanics and narrative and witness the development of graphics from 8-bit to HD. The gallery hosting the history of computing and games zone is an amazing resource for learning, but your visit does not end there. After seeing and learning about the creativity of others in the past, the students join one of our workshops and then it is time for them to be creative and make something with technology. 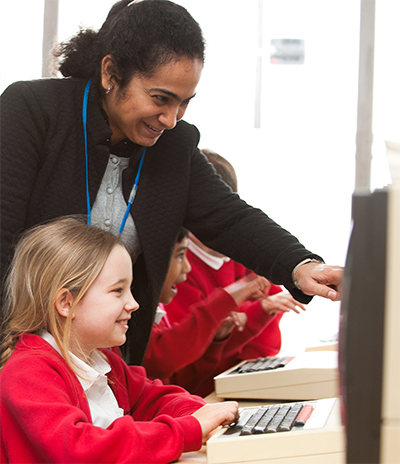 Taking place in our 80s classroom, in small groups, the young people can program a Raspberry Pi to control a device through to coding an 80s BBC Microcomputer. The choice of workshop for your students is made when you book your visit. Click on the image to the right to find out more about the workshops on offer as part of your visit. We warmly welcome any contribution made by you and your colleagues as your students visit each zone. We need your help to ensure every student gains as much as they can from their visit to the Centre. Please ask questions, raise points of interest, direct students and gather information for yourself. 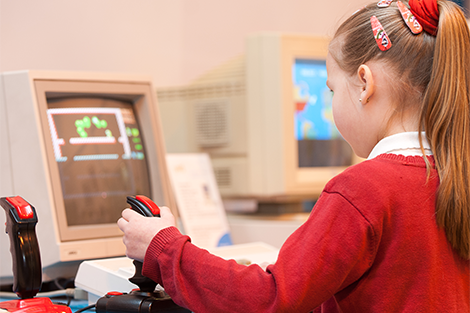 Your students' visit to The Centre for Computing History is a journey through; the computing timeline, computer games, megaprocessor and the workshop and offers our young visitors a unique and varied experience in four zones. Outside a normal classroom environment, the students’ experience at the Centre will motivate them and broaden their horizons enabling them to develop new skills and build relationships. Visiting groups are often broken down into smaller sets of no more than 15 students. These smaller sets rotate around the Centre's zones ensuring a good quality experience for the students and the best use of our resources and collection. Depending upon the size of your group we would recommend that your visit to the Centre should be between 3 and 5 hours duration. This is to ensure that all students can experience the workshop which runs for a minimum of one hour and can accommodate a maximum of 15 students per session. Most visiting groups arrive between 10.00am - 11.30am and depart between 2.30pm - 3.30pm. Group bookings are accepted, arranged and charged on the basis of their size. You can find out more about group sizes, times and charging by checking out the 'Book your visit' section. Who at the Centre will work with our students? The majority of education group visits to The Centre for Computing History are supported by Dr Anjali Das, our Head of Learning and Jeremy Thackray, our Assistant Curator at the Centre. From time to time they will call upon extra help from volunteers with particular specialisms. All Centre staff and volunteers that have direct contact with young people have been cleared via the Disclosure and Barring Service (DBS). Centre staff and volunteers do not act on behalf of your organisation's supervising adults. We require all visiting groups to include the required number of supervising adults. At least one adult from the visiting organisation must be present with each subset of the students as they move around the Centre. The behaviour of the students is the responsibility of the visiting organisations' supervising adults at all times. What age range is best served by a visit? The Centre for Computing History is pleased to host visits across a wide range of ages and ability. 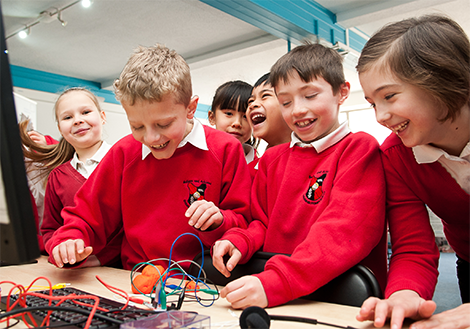 With a clear benefit to the Computing curriculum, a visit can also support Science, Technology, Engineering, and Maths (STEM). We also have much to offer students and teachers in other subjects and disciplines such as Science, History, English, Art, Design Technology, Mathematics and of course literacy and numeracy. groups of students from overseas educational organisations. The Centre is happy to support a pre-visit by the organising teacher to agree the detail of the programme for their visiting group.